This 18th-century print, designed and engraved by Claude Gillot, is from a set entitled Livres de Portieres. The designs were meant to be applied to tapestries or draught screens. The example here shows Neptune, the mythical god of sea, surrounded by sea shells, the raging sea and sinking ships. Other prints in the set show characters from Greek mythology such as Bacchus. Ornament prints such as these were designed for the use of craftsmen; this one was particularly aimed at artisans working with textiles. 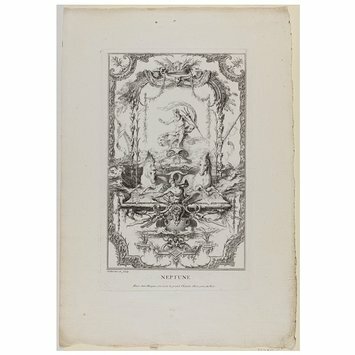 Print showing the mythical figure of Neptune riding a wave, surrounded by an ornamental design with horses and foliage. Uneven edges.